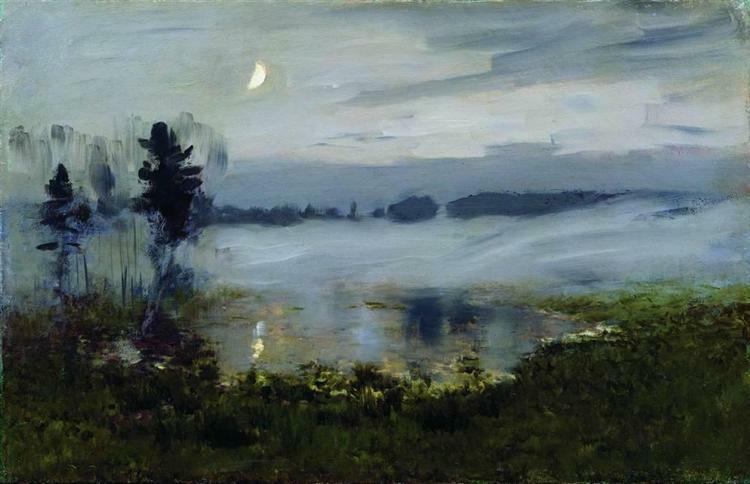 Iscaac Levitan was a renown classical Russian landscape painter, he used the so-called genre of “mood landscape”. – I’m assuming these are paintings depicting the various moods of a human according to the images. (Please correct me if im wrong). Some artworks which involve religious or fantasy topics use the quality of dim night-light to create mysterious atmospheres. They tend to illustrate the illuminating effect of the light reflection on the subjects under either moonlight or artificial light sources. He mastered the true essence of colour, where to bring about light along with darkness. Shadowing & highlighting which would illuminate the painting as though it shone at all times. It’s almost as though he was blessed with a divine gift in being able to display all the seasons of the year, different times of the day & a vast variety of natural views. Isaac Levitan was born in a shtetl of Kibarty, Augustów Governorate in Congress Poland, a part of the Russian Empire (present-day Lithuania). Raised in a not so wealthy jewish family although they refused to prevent that from them educating themselves, young Isaac & his family relocated to Moscow where he was taken on (with a scholarship) at a painting school. Devastating news followed as both parents passed away leaving him an orphan. Thanks to his immense talent he was able to pull through & survive through the difficult years ahead. Let me share some of my favourite paintings this incredible artist gave to the world. Is this a farm? The autumn season is here, look how those leaves have changed to a yellow, transitioning into bits of burnt brown. Am I stepping into this painting? I cannot fathom how inconceivably real this seems. Wait is this a photo or painting – DAMN! Apparently there’s a tale to this painting. Isaac was unaware when his next meal would be & how he would afford it. He was in a constant state of abject poverty. Money would come & go. Sadly he was diagnosed with having a degenerative heart disease, the doctor informed him to go to a warmer climate hence he moved to Crimea. This was where he brought about his ideas and scenic views for new paintings. Thankyou Isaac for imparting your incredible talent & sharing it with us. Je t’aime.